It’s not easy to be an Entrepreneur. Being an entrepreneur….that description is usually received as something very positive. It may surprise you to read that it aint necessarily so. After all, entrepreneurs are among the most glamorized personalities we see in our media today. Both on TV and in the press. Actually, public trust in entrepreneurs is greater currently than that of Congress or the Church. That’s what Sam Lessin said. Lessin is an entrepreneur and co-founder of the Palo Alto-based Drop.io, an early, user-friendly file sharing service, started in 2007. The company is no longer. It was sold to Facebook in 2010 (and probably not because Facebook wanted Drop.io’s product, but, more likely, they wanted Lessin for their team). Lessin worked at Facebook for a while as VP of Product. But he’s no longer there, either. What Lessin said will resonate with you if you are a true entrepreneur. And if you’re an aspiring one, I tell you, believe him! Every word of it. A psychologist listening to what Lessin is saying would likely diagnose that as Bipolar Disorder. But the fact is that this is the natural condition for the entrepreneur/Startup founder, pretty much anywhere in the world. Eight out of ten start-ups will fail within the first 18 months, according to Bloomberg. Fortune and Forbes Magazines say nine of ten. Those are the statistics. The would-be entrepreneur is left staring those staggering odds in the face all day long. That’s before they’re even ready to bring their plans before their peers, friends, and family. You know—those lovely folks, your “inner circle,” who’re always just ‘so generous’ with their advice. Is the word confidant French for Negative Nancy? Yes, entrepreneurs across the globe need all the help they can get because they have so much working against them. It’s crazy! Once an idea begins to move away from the abstract, into something real, it seems like no one is on your side. Why? That’s a blog post for another day. For now, just know that is the common experience. Support in one’s entrepreneurial journey is hard to come by. Especially early on. Perhaps the most gaping obstacle is the hanging specter of self-doubt. We expend so much energy throughout our day combating it. Our company Office Divvy, and a few companies like us, strive to remedy this collective malady. If they’re just starting out, we surround them with not only resources and services, but also with people, our team, whose job it is to help them succeed. Anything to give them a fighting chance. Equally important, we surround them with peers—a community of entrepreneurs who actually speak their language and help one another in more ways than there is room for in this post. We help entrepreneurs vet their idea and give them honest feedback. And they can trust that ours is coming from a place of experience unlike what they were receiving before. Now, that was the roundabout way of getting back to what this post is about. The Blue Eye. What do you know about the Nazar Boncuğu? Nazar Boncuğu is Turkish for Blue Eye (the good luck charm and bead). You’ve probably heard something about the Evil Eye superstition. It’s taken very seriously in Turkey and in various Eastern European and Middle Eastern cultures. Perhaps superstition isn’t the correct term here, because we all know juju is a real thing! And that brings us to my first formal introduction to our friend, aid, and bodyguard Nazar. My first Blue Eye memory came years ago when Ky and I took a trip to visit his family in Istanbul. That was my first ever trip to Turkey. On our very first day there, Ky’s mom, Sebo, reached over and pinned a tiny glass Blue Eye on the inside of my sweater, carefully placing her hand over it. I found the trinket colorful and eye-catching, certainly a little different….I could sense from the care she showed in bestowing it that this was no token souvenir…This was something profound. I didn’t know what to say, but, fortunately, Ky was there to explain that his mother was giving me protection through the gift of the Blue Eye. 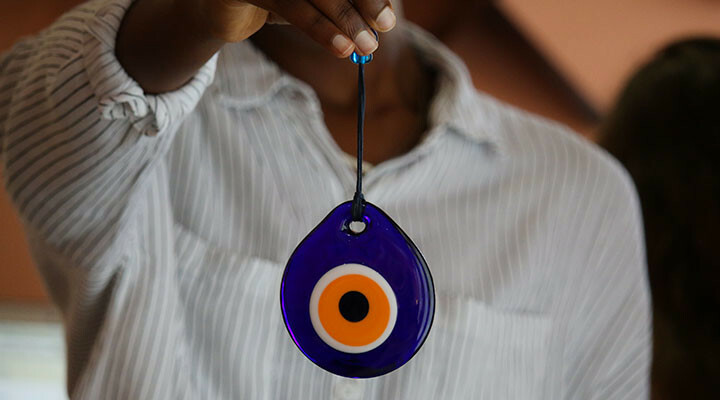 A long, long time ago, Turkey devised the Nazar Boncuğu talisman as a counter-punch to Evil Eye beat-downs. Not only in Turkey, but in many eastern countries, this object of mysticism (found in every size imaginable) is hung in homes, offices, and cars. Sometimes it’s hidden in children’s clothing, or incorporated into jewelry and ornaments. Similar, in a way, to the Native American dream catcher, instead of capturing bad dreams, it protects us from negative thoughts or attitudes directed our way. The Evil Eye is believed to cause misfortune or injury, but it may act subtly in the form of jealousy, or just the absence of support. More often than not, it does. The Blue Eye steps between us and the Evil Eye, placing itself in its crosshairs, keeping us out. As entrepreneurs, we could do without any added ills from above. The life of an entrepreneur is hard enough as is. Even if you hadn’t heard of the Evil Eye before this post, you understand the stink eye or side eye. As entrepreneurs, we get more than our fair share of it. We all know those people who get a charge from counting off our unsuccessful ventures, those who love to warn us of the worst case scenarios of going out on our own, or their misgivings about our potential. At Office Divvy, from Day-1, our mantra has been to empower entrepreneurs. Whenever we think of our clients and their business, it’s much like when dear Sebo placed her hand over my heart and pinned that Blue Eye to my sweater. We have built a business that feeds an ecosystem of support for budding entrepreneurs. We are actually invested in, and betting on, your success! When we decided to redo our logo, three years into Office Divvy (late 2010 and early 2011), we knew that our most visible brand identity, our logo, had to reflect our company culture. When we were getting started ourselves, late 2007, we had our logo done by a well known NYC-based graphic designer. But as our company evolved and matured, we began to pivot our services. Our mission broadened. That original logo ceased to truly represent us anymore. We had to live with our original a few more years because other priorities got in the way. But in 2014, we finally moved on it. Each stakeholder was on board with incorporating the Blue Eye. That was the easy part. In graphic art, artists will often tell you what appears most simple is actually the opposite. We were reminded of this through the long and painstaking path of encompassing everything you’ve read above into the totality of a single image. You’ll see that in these early draft iterations (done by Ky and me). But, as you can see, much was left to be desired. So we kept going back and forth with sketches and began collaborating with others. We took a long time in meetings to ensure our collaborators understood our story. It was important that those whom we tapped to work on this could internalize our desired brand attributes: Something modern and progressive, yet nurturing. We had an illustrator, Ezra Salkin, draw some organic sketches. We took those, put together a creative brief and invited local graphic artist Joey Santos to move it further along. He came up with some interesting designs..
More, more, more. You will notice below that the last round has two designs that are close…Can you spot them? This went on for nearly four months. Below is a sketch from me to Joey with very specific feedback. Closer still, but not quite there. We invited Angela Miniagi, another designer, into the process. With our direction, she got us to the icon that actually incorporates the eye into a map marker…But iterations continued until we found the right font and typography layout. Uggghhh.. Finally the text and logo landed on the same tarmac. The whole process took 19 months. We hope you see what we see in our logo, something emblematic of a safe place: A hedge against the nay-sayers. At Office Divvy, we always say you’re in business for yourself but not by yourself. As an entrepreneur you want to surround yourself with people who want you to succeed. You don’t need to hide us in your clothes, but We are your Blue Eye.